This week’s trash and recycling pickup will not be altered by Tuesday’s winter storm. Trash and recycling will be picked up as scheduled on Thursday, March 16, 2017. Residents are reminded that trash/recycling should be placed curbside the night prior to pickup. 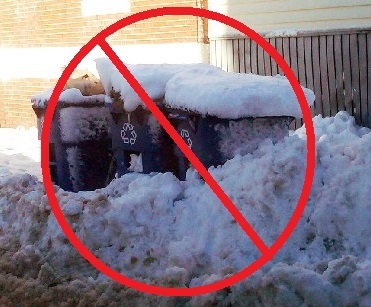 Please remember that crews have a tough time reaching trash containers and recycling bins when located in or behind snow banks. Please clear an area at the curb, or put containers next to or in front of snow banks, but out of the way of moving traffic. Open recycling bins should not be placed out for pickup if high winds are forecasted.